You can keep track of data usage and control connection to mobile data service on your Samsung Galaxy Tab S. Here's a quick guide on how to manage your tablet's data usage to avoid extra charges on your account. Your tablet comes with a built-in data usage application, to show you much data you have been used and which apps or services are responsible for your data usage. Aside from setting mobile data limits, you can also view Wi-Fi usage, restrict background data usage and turn data roaming usage on or off. Here are the steps to check data usage settings on your Samsung Galaxy Tab S.
1. Press the Home key to get to the Home screen. 4. Tap on the Connections tab. a. Mobile data - this option is used to enable or disable Mobile data on your device. Another way to get to this setting, and control Mobile data is through the Notification Panel. b. Limit mobile data usage - this option (when enabled) will disable your mobile data connection when the specified limit is reached. Just enable this option setting, and then drag the red limit line on the graph below to set the data usage limit on your device. c. Alert me about data usage - this option (when enabled) will trigger your tablet to alert you when mobile usage reaches the warning limit you set. After you enable this setting, drag the orange warning line on the graph below to set the data usage warning limit on your tablet. 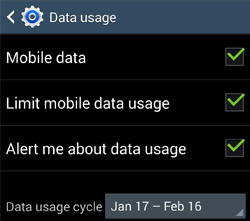 d. Data usage cycle - to enable this setting/option, tap the menu and then select a time period for data usage. Once you do, you should then see data usage for the period shows on the graph along with usage by app beneath. a. Data roaming - this option will allow data usage while roaming. Please note that extra charges may apply when roaming. b. Restrict background data - this option allows your tablet to connect to the network in the background, for syncing or other services. When you enable this feature, background connections will not occur. c. Auto sync data - this option (when enabled) lets your tablet sync with accounts automatically, at any time. d. Show Wi-Fi usage - this option (when enabled) prompts you with a separate tab showing data usage while connected to a Wi-Fi network. e. Mobile hotspots - this option will let you choose Wi-Fi networks that are mobile hotspots. You can prevent certain apps from using these networks and configure apps to warn you before you use these networks for large downloads. And that would be all for data usage management on Samsung Galaxy Tab S.
Always remember, setting mobile data limits is recommended to avoid incurring charges for more data usage.